It’s October, while we still haven’t turned on the furnace, there’s definitely a chill in the air, and it feels great to wear a sweater. My sister came over to play cards last night, actually we needed to practice as we’re having a card night with friends later this week, and we haven’t played since the spring. We played Kings Corners, which is fun, strategic, and frustrating, which for me is the perfect card game. For supper I decided to make soup in celebration of autumn, along with a simple cheese & veggie flatbread. 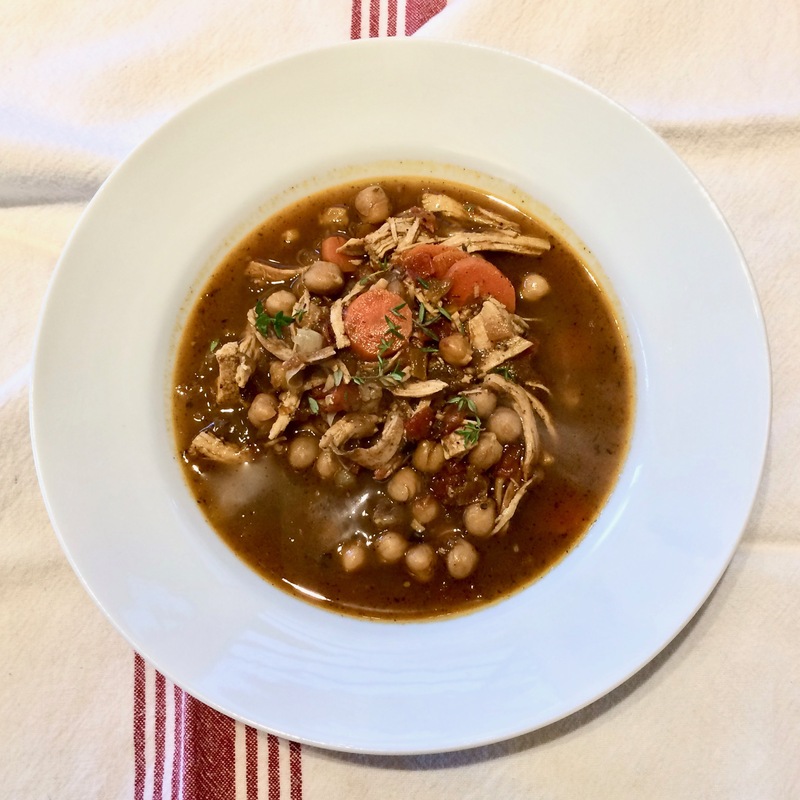 I wanted to make Posole, because of a dream I’d had recently. After explaining to anyone who wanted to hear (in my dream) that a bowl of heated dirt was not, in fact, true Posole, I awoke wanting to make the real thing. But living on an island, we can’t always go out and buy things like Hominy & the right Chilies. Staring into my pantry, I spotted jars of Za’atar and Sumac, and my brain clicked into place, so I grabbed them as well as smoked paprika and a tin of chickpeas. 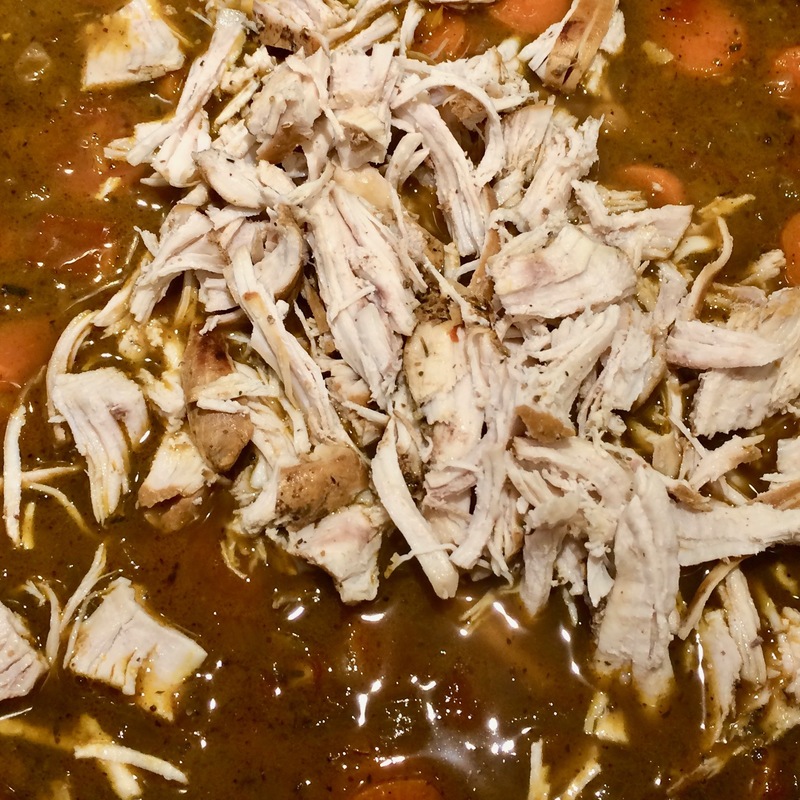 With a great chicken stock ready, and a chicken breast in the freezer, I knew that they would come together to make a hearty soup. The meal started with a small dish of Baba Ghanoush and some sweet potato crackers, along with a yummy Sangiovese. Next up was the soup with the flatbread. 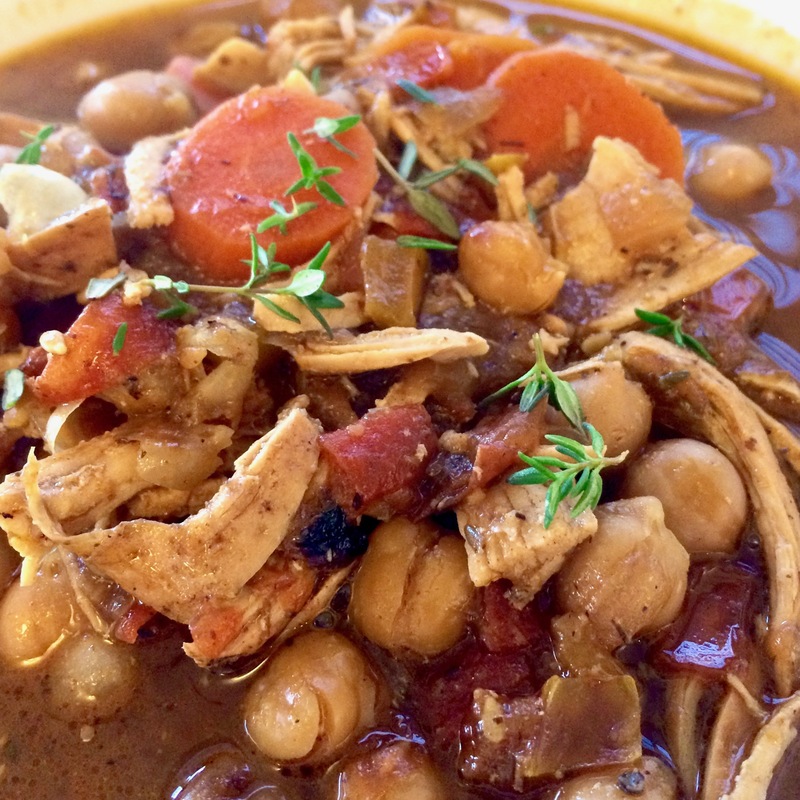 The soup had so much flavour, with a deep broth, full of chickpeas, carrots, and pulled chicken. Not a huge meal, but an absolutely perfect Card Night supper. Core & seed the pepper, cut into pieces slightly small than the onion pieces. Core & seed the tomatoes, cutting into pieces about the same size as the onions. Season the chicken breast with salt & pepper. Rinse and drain the chickpeas. 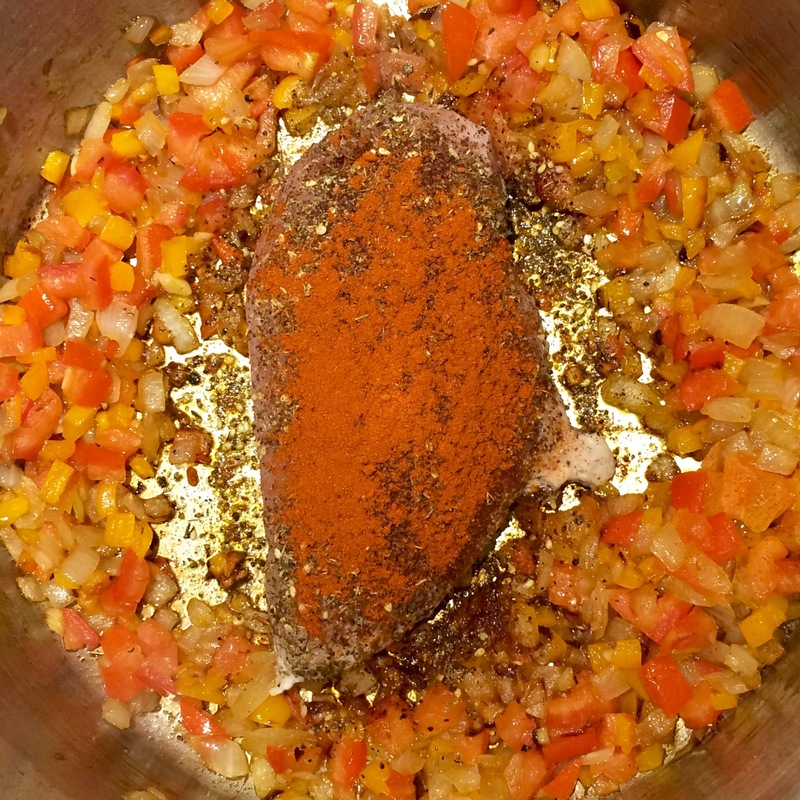 Heat the oil in a Dutch oven or large pot. 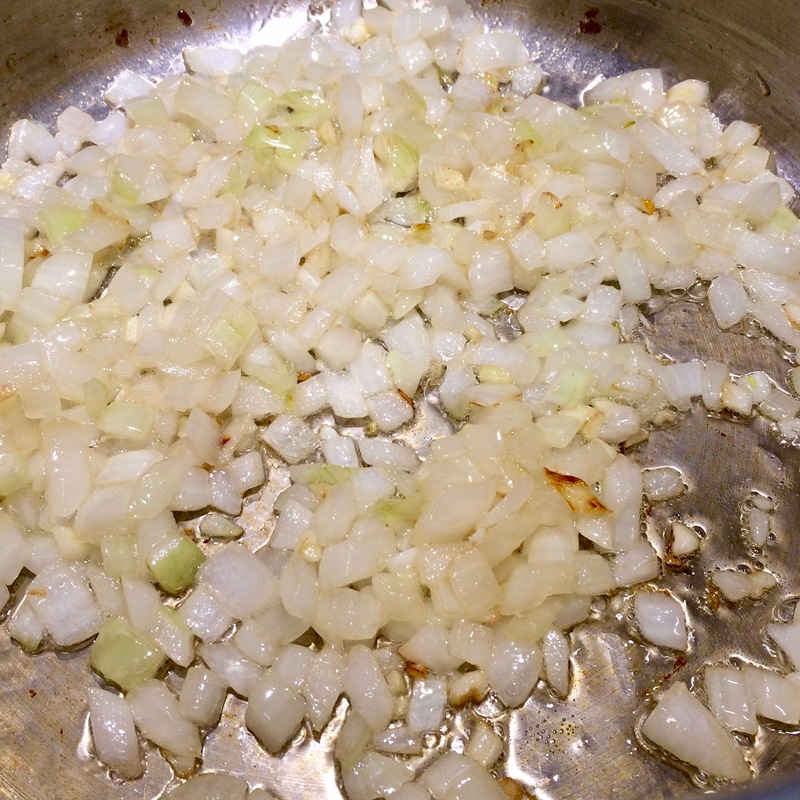 Add in the garlic and onion, cooking & stirring occasionally for about 4-5 minutes, until translucent and starting to colour. Add in the peppers, continuing to cook & stir occasionally for another 3 minutes. 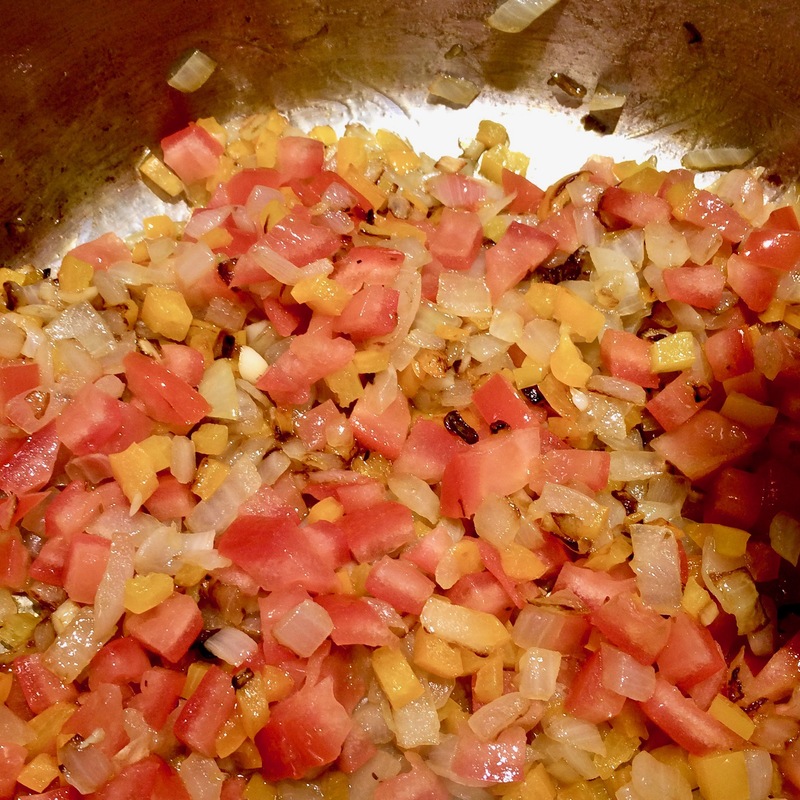 Add in the tomatoes, continuing to cook & stir occasionally for another 2 minutes. Move the vegetables to the outside edges of the pot. Place the seasoned chicken in the center of the pot. 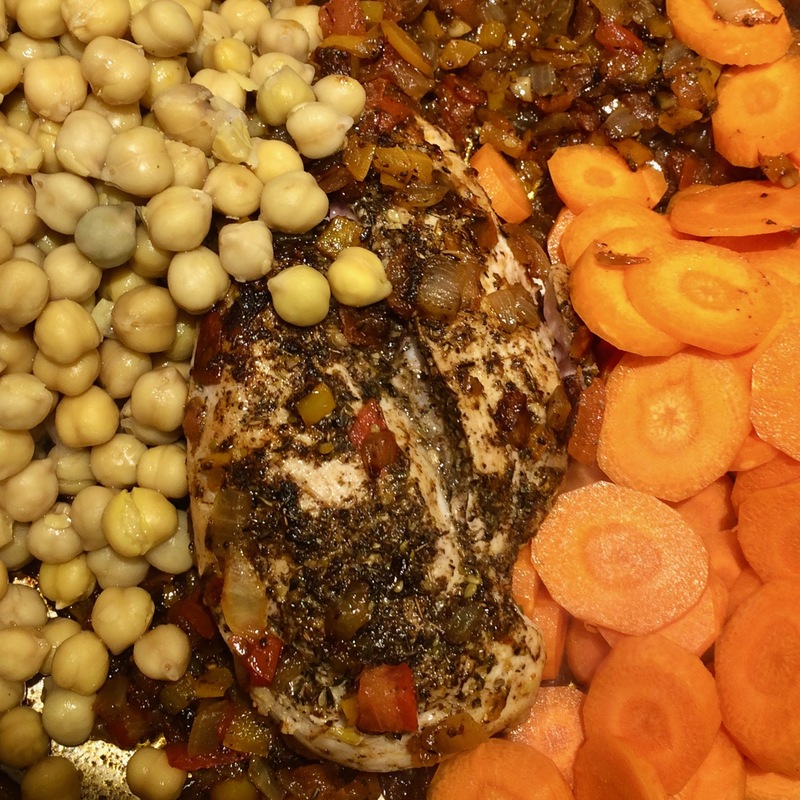 Sprinkle the za’atar, sumac & smoked paprika over the chicken and vegetables. Cook for 5 minutes, occasionally stirring the vegetables. Turn the chicken, and cook for another 5 minutes, stirring the vegetables a bit more. Add in the carrots and chickpeas. Cook everything for another 4 minutes over medium high heat, stirring once every minute. Add in the chicken stock, and bring the soup to a boil. Reduce to a simmer, cover, and simmer for 30 minutes. Turn off the heat and remove the chicken breast from the soup. Let cool for 15 minutes. 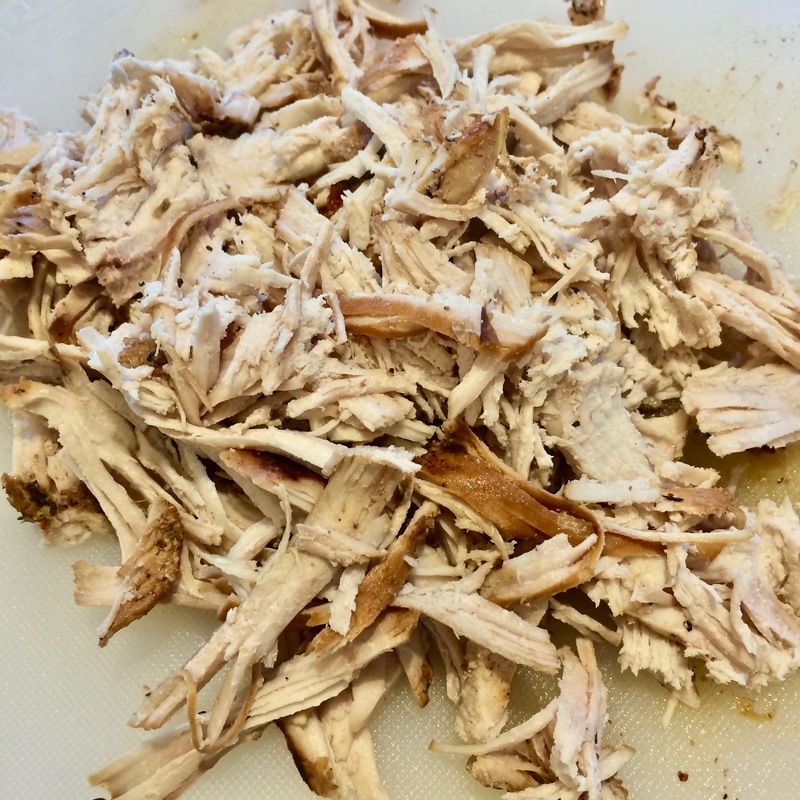 Cut in half lengthwise, and pull apart the chicken. Return the chicken to the pot. Adjust the seasoning using salt & lemon juice, as needed. Bring back to a boil and serve. 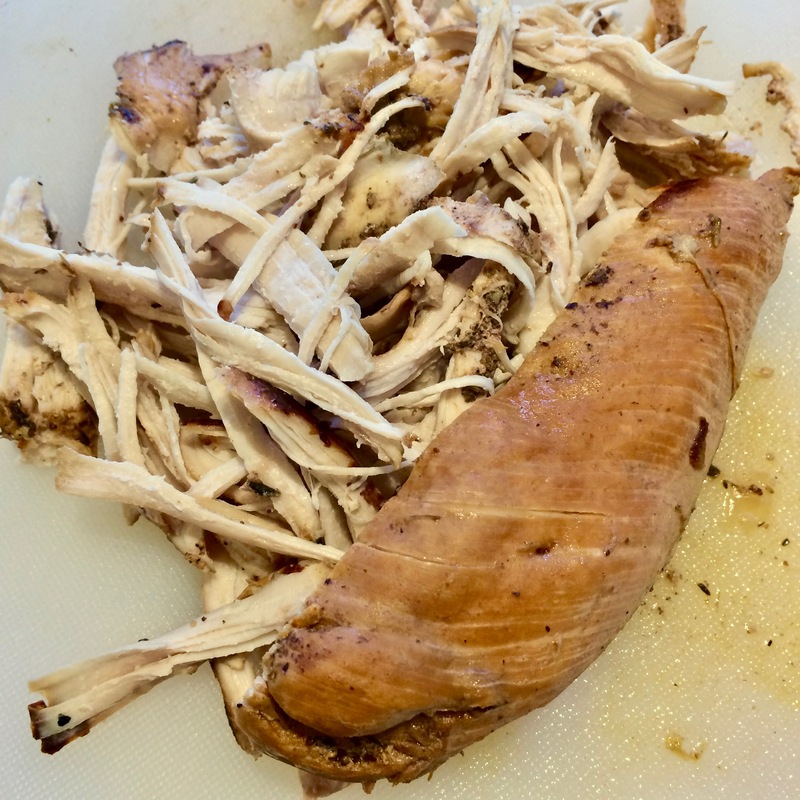 Vegan ~ use vegetable stock and a zucchini (5-6 oz / 140-170 gr) in place of the chicken, cut it into quarters lengthwise, and cross cut into ½ inch pieces. 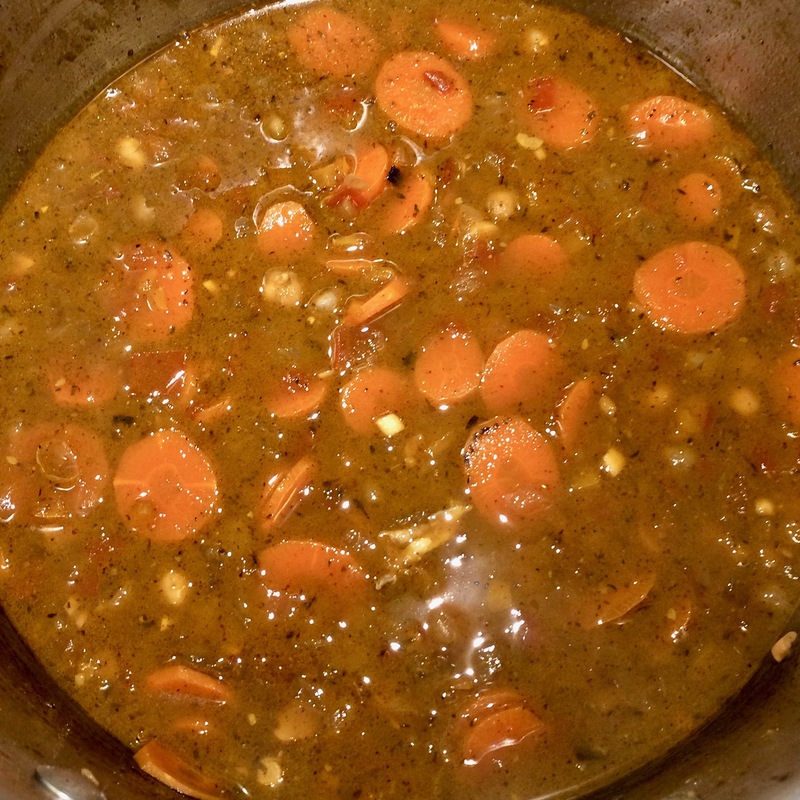 Add to the soup with the spices when you add in the carrots and chickpeas. Yogurt ~ serve with a dollop of plain Greek yogurt or sour cream. Store in a small jar or sealed bag for up to a month. Click here for printable version. Yummy! This soup sounds and looks delicious! I will have to look for some sumac next time I get off my island and get to the shop! I hope you are enjoying the lovely fall sunshine. Bulk Barn is a great source for lots of different spices and herbs. Yes, am loving the sunny, cool days. A wonderful time to be living on the coast!